Extra Vision Clip Corner showcases are intended to increase the display section in corner areas. The display area on an Outside Corner showcase is on the bigger and outer side of the case, facing the customers. Extra Vision corner showcases are compatible with all Streamline Extra Vision showcases. Each case comes with two clipped shelves to match the adjacent cases. 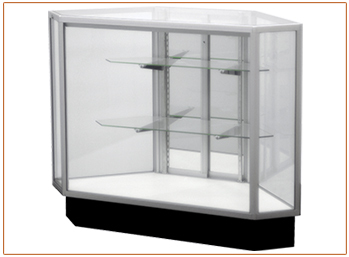 Ready-to-ship showcases come equipped with mirrored doors, fluorescent lighting, electrical plug, and lock. To view more ready-to-ship showcases from the Streamline Extra Vision series, click here.